Do you have a minute to spare to learn some English? 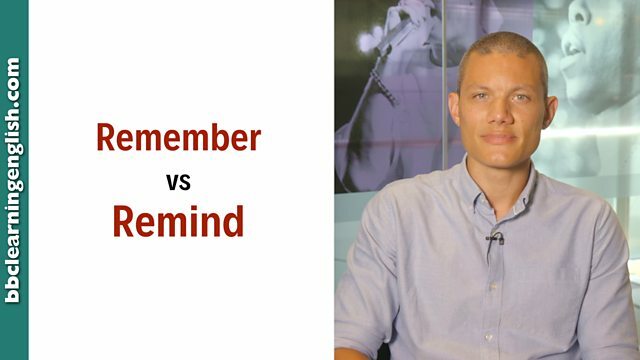 Dan discusses the differences between remember and remind. Give us 60 seconds and we'll give you the English! Both remember and remind are verbs of memory but they are not the same. Remember is about having a memory. It has two verb patterns with a big difference in meaning. Remember + (verb)ing is used when we remember something from the past. First the action happens and later we remember it happening. I remember meeting you at a party ten years ago. She doesn't remember visiting us last year. Remember + full infinitive verb is used to remember something that must be done in the future. First we think of the thing we need to remember and later we do the action. I must remember to do my shopping later. Remind means make someone remember. Its verb pattern is remind + somebody + full infinitive verb. Something can also remind you (or someone) of something. You must remind me to do my shopping. He's always reminding me to keep hold of my keys. That smell reminds me of my mother cooking. London reminds me of my home city. We showed you two verb patterns for remember, but only one for remind. Which one was it? Which of these verb patterns is incorrect? Which one of these does NOT use the verb 'remember' correctly? You need two words here. A person and a preposition. Complete this sentence: This band reminds ________ a girl I used to dance with at university.